Weighty Matters: Is Thin too Expensive? I realize that at first glance, that may look like an odd question. Recent research however, suggests that it might not be. A recent study, by Pablo Monsivais and Adam Drewnowski published in the December 2007 issue of the Journal of the American Dietetic Organization, looked at the relative cost per calorie of 372 "low energy dense" foods and "high energy dense" foods between 2004 and 2006. Low energy dense foods would be foods that gram per gram have fewer calories. 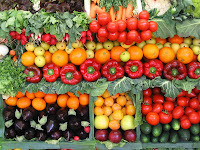 Fruits and vegetables would be the staples of the low-energy dense shopper. High energy dense foods gram per gram have more calories and tend to therefore be foods high in fat and/or sugar. This is often the realm of junk food. Ready for the important and even somewhat surprising results? Low energy dense foods are much more expensive than high energy dense foods, and while that may not surprise you, the difference in cost may: The least energy dense foods cost $18.16/1,000 kcal as compared to only $1.76/1,000 kcal for foods that were the most energy dense. Also incredibly important to note, inflation affected low energy dense and high energy dense foods very differently with the 2-year price change for the low energy dense foods being +19.5%, whereas the price change for the high energy dense foods being −1.8%. So in summary, not only are low energy dense foods far more expensive, their comparative inflation rate over the course of the past two years was 400% higher than the general rate of food inflation and more than 2000% higher than the junkiest of foods. Put another way, based on a 2,000 Calorie per day diet, if you choose primarily high energy dense foods your Calories will cost you $3.52 a day as compared with a diet consisting primarily of low energy dense foods that will cost you $36.32 a day. Any wonder why we're getting bigger? Wanna guess how long it'll be before the government steps in and subsidizes our health food baskets? We're in really big trouble.